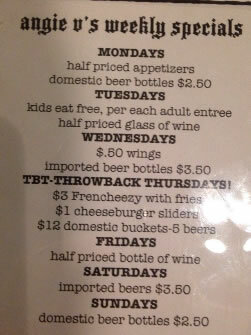 We have new restaurants in Warrenville! I had hoped to review them, but I haven't been to any of these new restaurants yet. In trying to find their addresses, I found a Dining in Warrenville page on the city's website. There were many other restaurants that I had not heard of before, but I don't think they are new. More places to visit. Serves lunch and dinner, has daily specials and some good reviews, along with photos and the list of daily specials copied from Yelp. Haven't been to the Warrenville location, but the ice cream in West Chicago is delicious. Ice cream, ice cream bars, flavored waters, and other treats. Ice cream in winter? Why not? Open for breakfast and lunch every day, dinner on weekends for now (hours will be expanding, so call for current info). 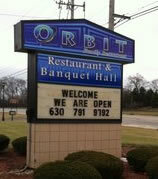 Orbit features a big menu with daily specials; they serve most anything you might want. Specialities is a Bakery and Cafe serves Peet's coffee along with soups, salads, sandwiches, salads, bakery, and breakfast items. Services include catering and online ordering. It is open from 6 am until 7 pm weekdays and 7 am to 6 pm on weekends. Specialties is part of a small chain, and this Cantera location is the only suburban Illinois store. Sweet Potato Cafe will now be open until 8pm for dinner Tuesday thru Saturday. I've also heard rumors that a liquor license is in the works, so stay tuned. It's nice to have new dining options, especially in the evening. See you there! Bon Appetit!